Posts. So, those candidates who are willing to work with this organization they May apply for this post. Last Date of Apply 10-June-2017. Total numbers of vacancies are 371Posts. Only those candidates are eligible who have passed MBBS or Possession of recognized Graduate Medical qualification included in the first or second schedule or part-II of the 3rd Scheduled to the Indian Medical Council Act, 1956. Holders of education qualification included in part-II of the 3rd Scheduled should fulfill the conditions stipulated in subsection (3) of section (13) of the Indian Medical Council Act 1956. 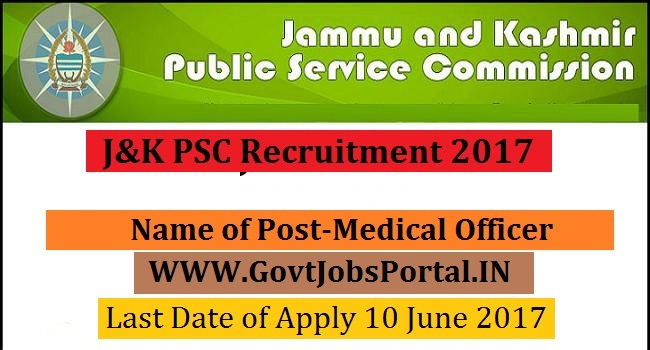 Indian citizen having age in between 18 to 40 years can apply for this Public Service Commission Recruitment 2017.